A daughter tells her father’s story in his own voice. Award-winning memoirist Yang (The Latehomecomer: A Hmong Family Memoir, 2008) focuses on her father, Bee Yang, who transformed his experiences and family’s history into songs. Yang and her siblings grew up surrounded by them: “my father sings his songs, grows them into long, stretching stanzas of four or five…raps, jazzes, and sings the blues when he dwells in the landscape of traditional Hmong song poetry.” Bee gave up singing after his mother died, in 2003, but as an adult, the author discovered the one cassette he had recorded and was struck by the songs’ “humor, irony, astute cultural and political criticism.” Yang’s evocative, often moving memoir, told from Bee’s perspective, reveals a life of struggle, hardship, deep love, and strong family ties. Bee was born during the Laotian civil war and grew to adulthood during the French occupation and the Vietnam War; “more and more men in uniforms entered our lives,” he remembered, and Hmong men and boys were recruited to aid the Americans. In 1975, when the Americans left Laos and the communists took over, “genocide was declared against the Hmong for helping the Americans.” Yang recounts in harrowing detail the persecution Bee and his community suffered. By 1980, Bee, his young wife, and baby daughter ended up in Ban Vinai Refugee Camp, in Thailand, where their second daughter, the author, was born. During the eight years the family lived there, Bee was forced by Thai soldiers to transport opium “from one uniformed guard to the next,” a mission he hated but carried out with “fear and shame.” At last, they came to America, where Bee took arduous factory work to support his growing family. Although he encountered prejudice and exploitation, he never lost hope for his children’s futures. 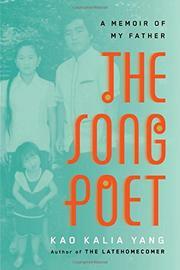 Yang’s gentle prose captures her father’s sufferings and joys and serves as a loving celebration of his spirit.